What are the best Windows 10 2-in-1 laptops to buy in 2019? 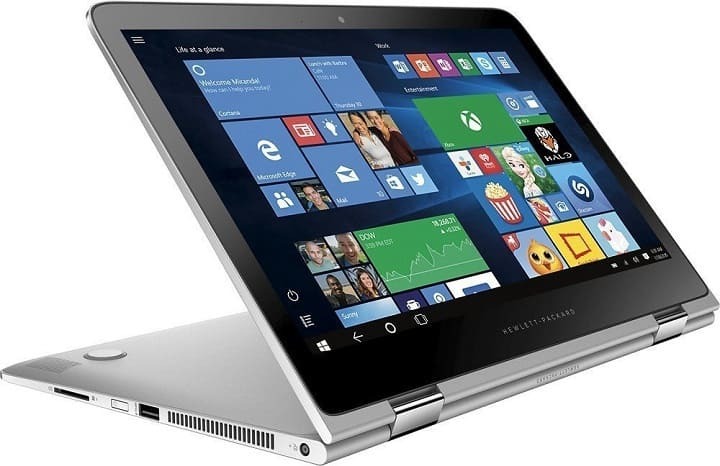 Home » Buy » What are the best Windows 10 2-in-1 laptops to buy in 2019? A 2-in-1 laptop is one of the fastest growing products in the PC industry. The touch-optimized hybrid laptop or the detachable-hybrid tablet with both a physical keyboard and a touchscreen are the latest trends, and if you plan to get one, you probably have already a few tablets in mind. It’s important to keep your eyes peeled for the best 2-in-1 laptops that you can buy this holiday season. Just to make your choice much easier, we picked the top five 2-in-1 laptops that you can get these days at great prices on Amazon. The Samsung Notebook 9 Pro can easily get head-to-head with the MacBook Pro for a significantly lower cost. Even if it’s limited to only one configuration, it comes in two different sizes. 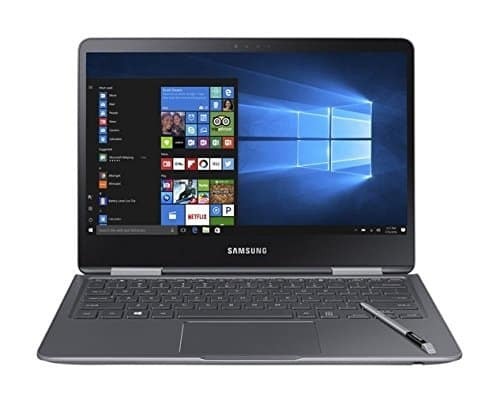 The Samsung Notebook 9 Pro is a really powerful laptop. It comes with an excellent look and feel. The Samsung Notebook 9 Pro uses the S-Pen for amazing effects. It comes with a Full HD touchscreen for hands-on control. It also features an HD webcam. 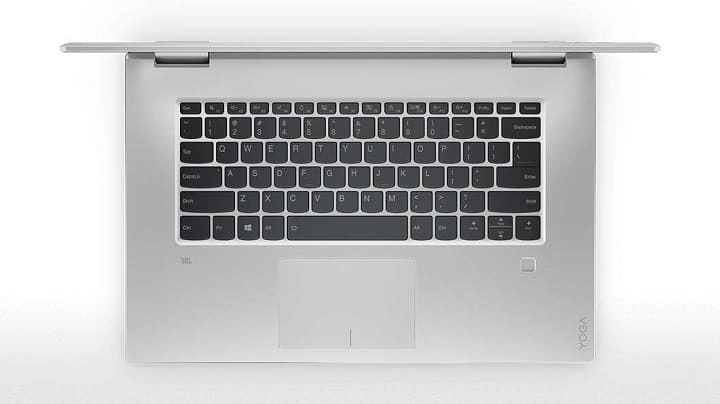 The laptop has a 360-degrees flip-and-fold rotating display. The technical specs that you should be aware of are the following: Intel Core i7 processor, an Intel HD 620 or an AMD Radeon 540 Graphics card, 8GB or 16GB of RAM, a screen of 13.3 inches with a resolution of 1,920 x 1,080 pixels and storage space of 256GB. The laptop is partly defined by its inclusion of the S-Pen, and it’s a heavy-hitting hybrid that is as capable as Microsoft’s Surface Book. You will not need to recharge the stylus. The HP Spectre x360 is more than just a mere hardware refresh, and it’s effortless to use a laptop. You can’t even tell if it’s best used as a laptop or as a tablet due to the fact that its keyboard feels so natural at the touch. It comes with silent fans. It comes with a 4K Ultra HD touch screen for hands-on control. The display boasts impressive clarity and vibrant colors. The Intel Turbo Boost Technology delivers extra dynamic power whenever you need it. It’s great for gaming and intense multitasking. The flash-based SSD has no moving parts, and this results in faster start-up times and data access. You will benefit from reduced heat production and power draw on the battery. It has a 360-degree flip-and-fold design that allows a versatile use as a tablet or as a laptop. Here are the technical specs that are essential: Intel Core i7 CPU, Nvidia GeForce 940MX and Intel HD Graphics 620, 8GB to 16GB of RAM, a 15.6-inch screen with a resolution of 3,840 x 2,160 pixels and storage space of 256GB – 1TB PCIe. This 2-in-1 tablet is a competitive device with the 15-inch MacBook Pro, and it’s also priced at a fraction of Apple’s flagship machine. The laptop has an unparalleled 2-in-1 performance. It comes with a competitive battery life. It has a 15.6-inch Full HD touch display for hands-on control, and it uses the IPS technology. It comes with a built-in HD webcam. The 360-degrees flip-and-flop design allows increased use versatility. It comes with Windows 10 Home preinstalled. 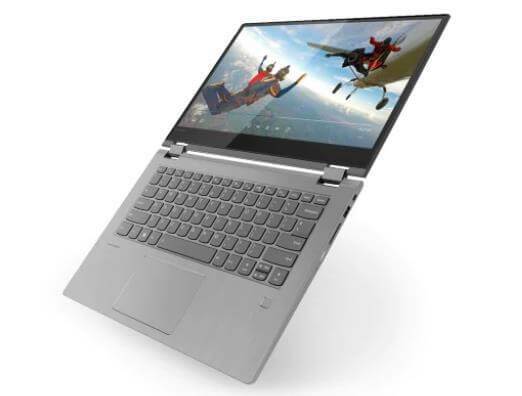 Here are the tech specs that are the most impressive in the Lenovo Yoga 720: Intel Core i5 or i7 CPU, Intel HD Graphics 630 or Nvidia GeForce GTX 1050, 8GB or 16GB of RAM, a resolution of 1,920 x 1,080 Full HD or Ultra HD with a resolution of 3,840 x 2,160, LED multitouch and storage space of 256GB – 1TB, 1 USB Type-C, and 2 USB 3.0, Thunderbolt, Wireless-AC and Bluetooth. UPDATE: The Lenovo Yoga 730 is now available on the market as well. So, if you want to upgrade your Yoga 720 laptop, you can purchase the new model from Amazon. 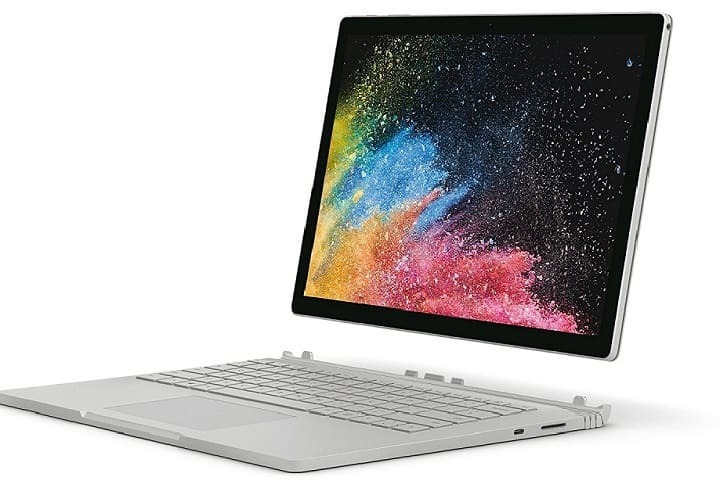 The original Surface Book blew everyone away when it came out back in 2015 and back then it was quite hard to tell whether it was a one-time novelty from the company or if it was just a sneak peek of something else that was on its way. Overall, it was a bit of both. The Surface Book 2 is just as impressive, and it comes with a lot of the qualities boasted by its predecessor. You have four versatile modes to choose from crafted of premium and lightweight materials. 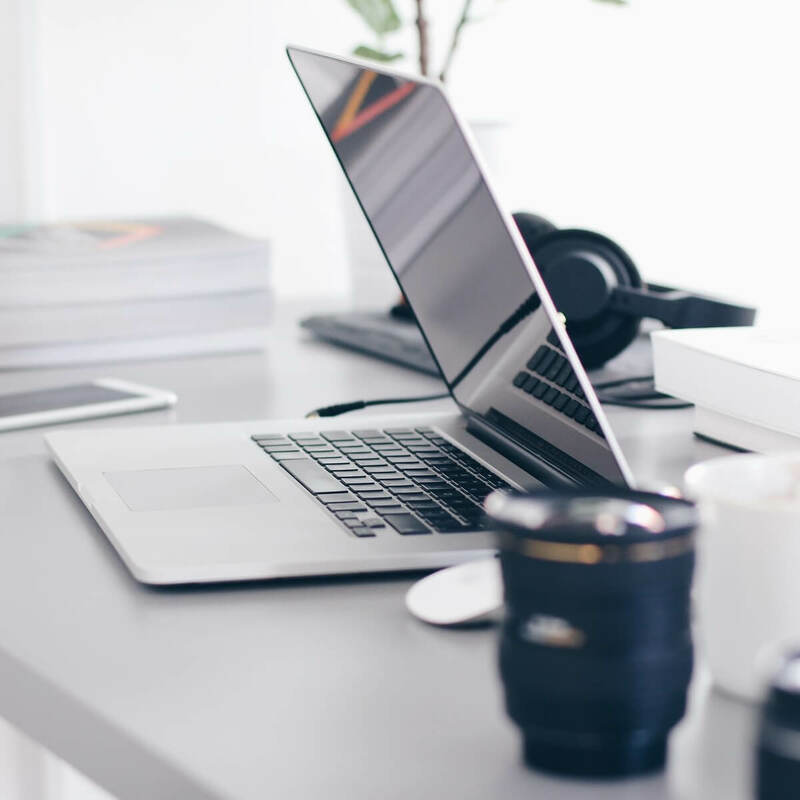 The device adapts easily to the way that you work and create as well. The Surface Book 2 brings the best of Microsoft no matter where you are. It comes with Windows 10 Pro pre-installed. It also comes with Microsoft Office2. With Windows Mixed Reality you will be able to immerse yourself in a brand new reality when you combine the Surface Book 2 with any Windows Mixed Reality headset and also a motion controller as well. 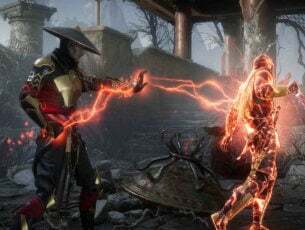 The essential tech specs are the following: Intel Core i5 or i7 CPU, Intel HD Graphics 620 or Nvidia GeForce GTX 1060 with 6GB GDDR5, 8GB to 16GB of RAM, a screen of 13.5 inches with a resolution of 3,000 x 2,000 pixels or a screen of 15 inches with a resolution of 3,240 x 2,160, 256GB to 1TB PCIe SSD. As its name suggests, this laptop is very…flexible. Its hinges support a full 360° flip-and-fold movement without any problems. You can use this device as a tablet, laptop, in tent mode, you name it. The 14-inch Full HD LED display offers excellent multitouch support. The 8th-gen Intel Core i5-8250U CPU can clock up to 3.4GHz. Add to that the 4GB/8GB/16GB DDR4 and 128GB/256GB/512GB/1TB SSD and you’ve got some really nice specs. What we really like about this laptop is its versatility. 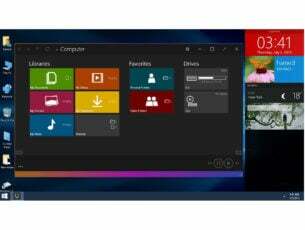 You can use it to play games, run office-related tasks, play multimedia content and much more. It also offers excellent connectivity and the lithium-polymer battery can power you for up to 8 hours. 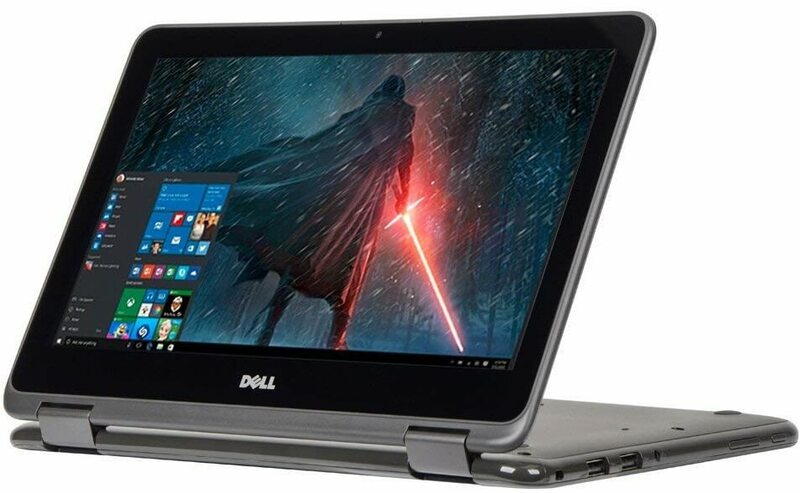 If the price tag is one of the main criteria of your purchasing decision, then this Dell Inspiron 11.6-inch laptop is the perfect choice for you. It’s not the fastest laptop on the market, but it’s excellent for everyday computing. It packs an AMD A6-9220e CPU 2.5 Ghz, HD LED-backlit touchscreen (1366 x 768), as well as 10-finger multi-touch support. This laptop is ultra portable weighing only 2.6 pounds with is ultra-thin profile of only 0.8 inches. It also has a really nice design. These were our best picks for 2-in-1 laptops for every budget and preference in specs and features. Check them all out and get your favorite laptop.